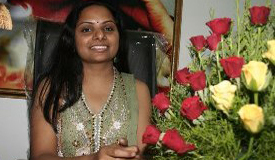 Kavitha arrested - Curtain raiser for KCR’s feat. Kavitha, the daughter of Telangana Rashtra Samithi leader K Chandrashekhara Rao and chief of Telangana Jagruthi Sanstha has been arrested few hours ago at Osmania University. Nearly 13 student unions and their leaders along with huge turn out of Telangana students started the rally as their support to leader KCR’s “fast-unto-death”. Police obstructed the rally at Osmania University gate and situation turned hostile when Kavitha arrived at the location to support student unions. Police unable to control the students have gone for lathi charge. Kavitha staged a dharna against the atrocities of Police in suppressing the Telangana movement, without leaving the place. Police had a tough time to control the activists of these student unions and at last they have arrested Kavitha and shifted her to nearest Police station. The position near Osmania University looked hostile with Telangana students raising the slogans against the Andhra settlers and Andhra politicians. Many in the city are worried about the KCR’s daring feat of “fast-unto-death” and its consequences on present politics. What's the message "Leader" want to give?